Paul Teasdale actually worked for ReMax International for 12 years. Paul was one of the owners of the ReMax branch in Spanish Fork for a few years. We share listings with each other's sites. 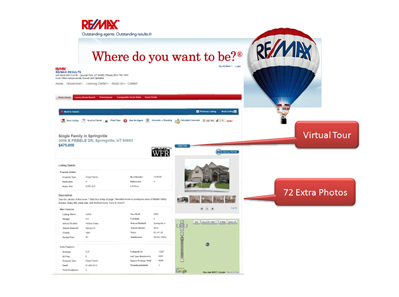 Team Teasdsale Realty allows the ReMax listings to appear on our websites and in exchange, ReMax lets Team Teasdale Realty listings appear on its website. See the picture below. You can see one of my listings that I recently sold in Springville Utah, with my virtual tour and 72 photos on the ReMax website. Paul is friends with many of the ReMax Agents in Utah County and has a large network. Get your home listed on many websites. 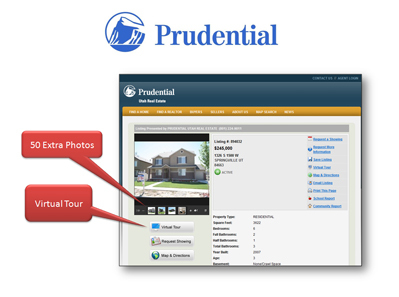 Our brokerage allows Prudential's listings on our websites, and in return, they allow our listings on their site. It is a fair exchange. This helps us promote your home on both sites. The listing on the right is a home listing in Springville by Team Teasdale Realty. This home shows 50 photos and our virtual tour on the Prudential website. We want to give our clients maximum exposure throughout the web. Since 1995 Paul has developed a friendship with many Prudential Realtors. Paul has sold their listings in Utah County, and they have sold his listings--great networking! Get your home listed on many websites. Team Teasdale Realty exchanges listings with as many Real Estate brokerages that allow exchange on the MLS. Coldwell Banker is one of the Utah Real Estate companies that allows listing exchanges. 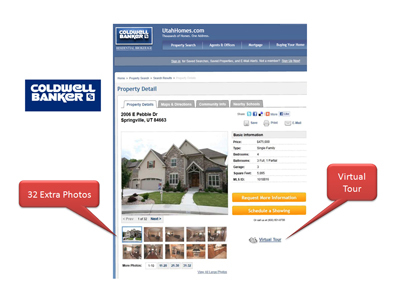 We also allow Coldwell Banker listings to appear on our websites. Below you will see our listing, with 32 extra photos and our virtual tour. In fact, if you click the virtual tour on any of these sites, it pulls the virtual tour from our website: UtahCountyListings.com. Paul has worked with many Coldwell Banker Agents over the years, and we work in cooperation with them to sell each other's listings. Get your home listed on many websites.